Containing more than 1,500 dramatic works from the colonial period to the beginning of the twentieth century, American Drama 1714–1915 is the largest electronic collection of American dramatic writing of its kind. It provides literary researchers and historians with a comprehensive survey of American dramaturgy from its origins up to the era of sensational melodrama and manners comedy exemplified by the work of such playwrights as David Belasco, Clyde Fitch and William Vaughn Moody. 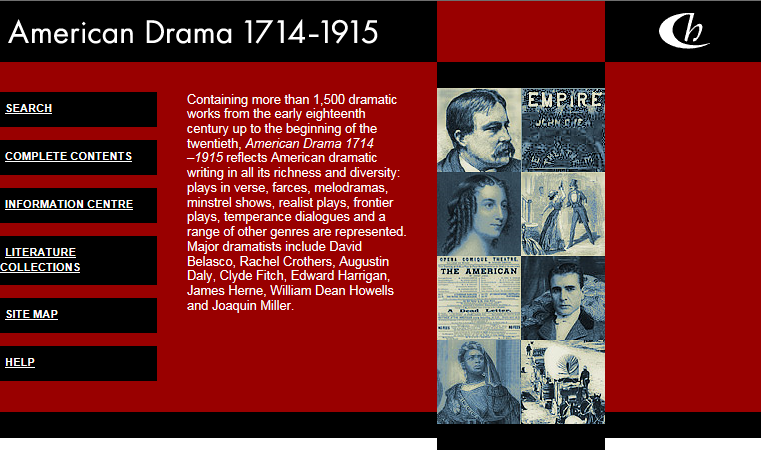 Full details of the works included in American Drama 1714–1915 are given in the bibliography. American Drama 1714–1915 reflects American dramatic writing in all its richness and diversity: plays in verse, farces, melodramas, minstrel shows, realist plays, frontier plays, temperance dialogues and a range of other genres are represented.